Former senior Australian diplomat Geoff Raby’s substantial article written for the Asia Society and reproduced in the Australian Financial Review this week continues his “realist” approach to discussion of Australia’s foreign policy choices. It’s another piece that is bound to get attention – who can forget his earlier call for Foreign Minister Julie Bishop to be sacked? Several ASEAN countries fall far short of adhering to a ‘rules-based order’, whether that term is applied to international behaviour or by extension to the conduct of domestic affairs. Now Raby offers another set of proposals in relation to Southeast Asia that raise some interesting points about what matters as Australia copes with unprecedented challenges in the formulation of its foreign policy, at a time when China is growing in power and the future course of US policy is less clear than has been the case since the Second World War. To quote one of Raby’s prominent recommendations, “Collectively, ASEAN is the most obvious body with which Australia should engage on a China-hedging strategy”. And he clarifies this observation by suggesting that Australia should “seek to strengthen and broaden each of our individual bilateral relationships across Southeast Asia as well as work with ASEAN collectively”. Raby’s article appeared soon after the “sham election” – a description of the event used frequently – in Cambodia that saw Hun Sen’s Cambodian People’s Party government returned to power with 80% of the votes cast and a participation rate of 82% of those eligible to vote. 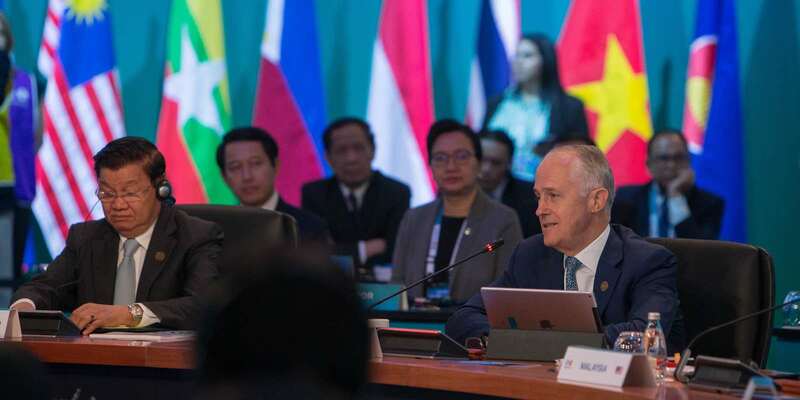 This result and other developments suggest that embracing the “ASEAN option” – my term – for Australia is going to mean associating ourselves with a sometimes troubling group of partners if the aim is to counter China’s hegemonic tendencies. While Cambodia is far from the most important member of ASEAN, it stands out for several reasons. It is the country that has most enthusiastically embraced an association with China, for which it acts as a proxy. Its political system, all Hun Sen’s pretence aside, is quite clearly anti-democratic, and the terrible history of the Pol Pot years has so far shielded it from any likelihood that the international community would seek to change its government by force, even if some countries are ready to impose sanctions against it. In short, Cambodia is the poster country for what an authoritarian Southeast Asian state can do when shielded by China, and is likely to remain so for some time to come. But, and this is the vital point, Cambodia is only one of several ASEAN countries that fall far short of adhering to a “rules-based order”, whether that term is applied to international behaviour or by extension to the conduct of its domestic affairs. When the ASEAN Special Summit was held in Sydney in March, at least four, and possibly five, leaders attending that event – and one who did not – posed a range of problems for Australian policymakers, or forced them to resort to one sort of fudge or other in welcoming them as worthy guests. Hun Sen is the obvious example, but how about the others? In light of the Rohingya crisis, Myanmar’s Aung San Suu Kyi has fallen from the pedestal on which Western admirers placed her. Her recent actions, or lack of them, give little reason to think she will ever be held in the same admiring fashion as in the past. Najib Razak, who attended the summit as prime minister of Malaysia, has now been charged with corruption. The prime ministers of Laos and Vietnam both preside over countries where there are severe limitations on freedom of speech and the exercise of religion. And while Vietnam has an historical antipathy to China, Laos has increasingly been drawn into China’s net. The prime minister of Thailand presides over a government that came to power in a military coup in 2014 and where the National Council for Peace and Order maintains curious “attitude adjustment programs” for those deemed to be critical of the military regime. And then there is President of the Philippines Rodrigo Duterte, who did not attend the summit but is continuing to follow policies in his country that raise serious questions about human rights. In making these observations I am not suggesting that Australia should only engage with those countries with which it agrees on all issues. Palmerstonian observations about friends and interests still have validity. What I do believe is worth emphasising is the extent to which there is too little recognition of just how difficult some of Australia’s choices are in the current unsettled international circumstances. And in this respect, I question whether regarding ASEAN as the answer to our dilemmas is quite as appealing a choice as Geoff Raby suggests. The social media network is a battleground in a sociopolitical conflict, prompting fractures and heresies within elites.